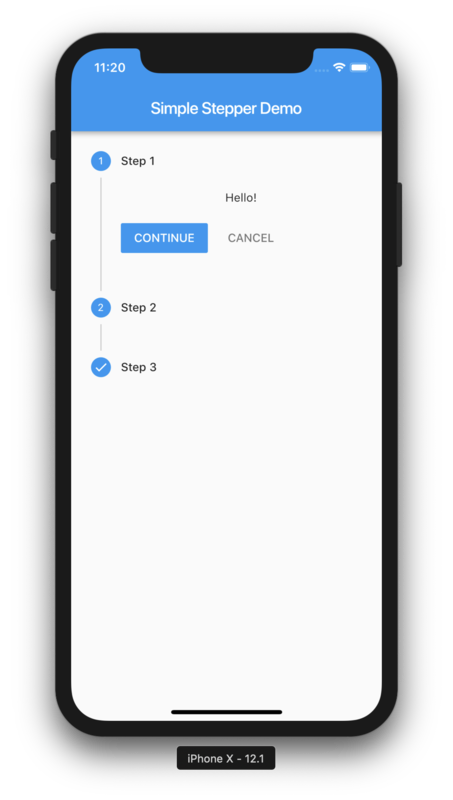 Stepper is an awesome widget in Flutter. It makes developers job easy by writing less code. Here we will have a UI as shown in the below screenshot. First we will create a list of 3 Steps. Each Step will have a ‘title‘, ‘content‘ and isActive property. ‘content‘ can be any Widget. To Keep it simple, I am adding one a Text Widget. You can even have different icon for each step. I have added a tick mark icon for the final step. Now Let’s add the stepper to the UI. onStepTapped will set the current stepper count. onStepContinue will increment the stepper Counter and setState is called on our variable that sets it to the next counter. onStepCancel will decrement the stepper counter and moves back to the previous step.